Hi there - Cait Morgan here...a bit out of breath, because my luggage is heavy, but I've arrived. Yes, I’ve finally made it to Budapest. I’m terribly sad that Bud couldn’t come with me, but we both know he’s done the right thing staying in Canada to help his mother with her recuperation from hip surgery. I’m not sure how I’ll cope without my husband’s steadying influence. I’m guessing I’ll over-eat a fair bit, and I might give in to the odd beer or two. Or, maybe grab a bottle of gin for the fridge to reward myself for a good day’s work. The Hungarian University of Budapest is putting me up at an apartment they keep for visiting professors. I’ve just arrived at the university’s admin building to collect the keys, and a Professor Patrik Matyas greeted me. He reminds me of a llama. I don’t like llamas – they spit while they’re smiling at you. And Patrik grins a lot. I hope I don’t have to spend too much time with him. I know Bud’s always telling me I’m quick to judge – which, given my training and skills in reading body language is, I think, a good thing to do. My initial reaction to Patrik is that he makes me want to take a bath, and scrub myself all over. Ah well, he’s being gratingly polite and helpful, so I’ll put up with it for now. I’m here for a whole month before Bud arrives, so we will at least have a week here together. But until then? Other than teaching and working on a research paper, I’m sure I’ll manage to find time to see some of the sights and – who knows – I might find something interesting to keep my brain ticking over, other than delivering courses on criminal psychology to Hungarian students. We’ll see. Cait Morgan Mystery #8, THE CORPSE WITH THE RUBY LIPS, was published in Canada on October 18th, and will be available in the USA from November 1st. It's available to order RIGHT NOW! Leave a comment below with your email address BEFORE MIDNIGHT EASTERN ON SUNDAY OCTOBER 23RD to have a chance to win a signed copy! I can't wait to read this! Thanks for the chance to win a copy-this is a new series for me. This is new tome as well. Aren't blogs wonderful! Wow, this looks great, thanks for the chance to win! Interesting how those release dates are different. Thanks! Well I hope Bud gets there before Cait has to put up with too much from the creepy Professor Patrik Matyas. Can't wait to read. Thanks for the giveaway. You are a new author to me. "The Corpse With the Ruby Lips" sounds like a great read. Can't wait to read. Thanks for stopping by Vicki ...now I have to ask you what plastic masks you're referring to...? I do love a mystery. Thank you. Sounds wonderful and I absolutely love the title...llama's huh...very good reference...please enter me. This mystery sounds very good. Thanks for a chance to win. This series is new to me. I would love to win #8. Thanks for the chance. thanks for the giveaway, this will be anew series for me. I would like to get involved in the Cait Morgan Mystery series. Thank you for this giveaway opportunity. 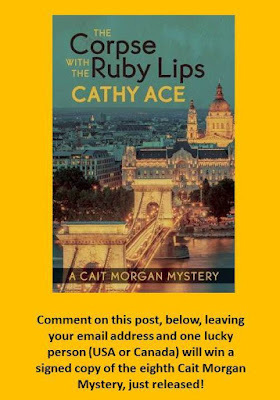 I would love to read this Cait Morgan mystery! New series to me, love discovering new series/authors:) thanks for the opportunity to win a copy. thanks for the chance to win! This will be new to me! Loved the fun post. Had some good chuckles reading it and congrats on another Cait Morgan mystery. Thanks for the giveaway. I love Cathy's books (as she well knows). I "only" own four titles and would kill to add this one to my collection. This sounds like a winner and I can't wait to read it! I enjoy your books.So I look forward to reading this. Thanks for This opportunity. This a new-to-me series too - and I can't wait to start. Cait sounds like someone I'd like to be friends with, and this trip to Budapest sounds like a dream come true. Thanks for the chance to win this entry in the series!